As we all know life isn’t easy and our human desire to be healthy and happy isn’t always satisfied. After a difficult week it was with a sore head and aching heart that I walked the path to All Saints in Woodchurch. It was early evening and initially all I could see was an expanse of strimmed grass underneath the trees. A few oxe eye daisies had escaped the strimmer and stood glowing in the evening light, statuesque against the grey walls of the Churchyard; their stems strummed by the invisible hand of the evening breeze making their lovely heads sway softly. On turning into the yard I could see the memorial roses in bloom, each one like the beautiful expression of the dear departed soul, coaxing and welcoming me into the Church. 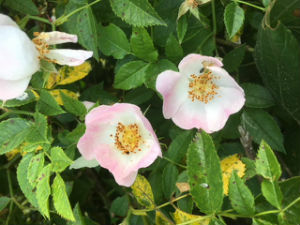 If one flower holds forth at Woodchurch it is the rose, everywhere you look the sweet scented flowers abound. From the sophisticated David Austin creations to the wild simplicity of Dog Rose in the hedge and rambling roses adorning the trees at the yard's edge and climbing the dark stone of the Church. There is a pure beauty about the rose that makes even the hardest heart soften. And so it was with my own heart ache that I could no longer feel sad in its lovely presence. I wonder how many others have felt the healing touch of the rose here, smelt its scent and felt their grief lifted. It's no coincidence that roses make us feel this way. Long associated with and used as a symbol of love the rose speaks to our true selves, love heals all it says. Eglantine refers to Rosa canina or Dog rose. This wilful beauty plays through hedges and trees where it can, the fairy cups of pale pink are short lived but perfect and pure in the moment. Of course just as Puck made mischief so have generations of school children, by grinding the rosehips that swell after flowering into itching powder for teachers chairs. 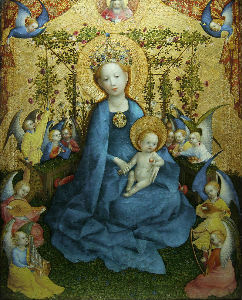 The Rose has long been a symbol of the Virgin Mary. She is often depicted holding a rose or sitting in a rose garden. The five petals are said to represent her five joys, those being the Annunciation, the Nativity, the Resurrection, the Ascension and the Assumption. 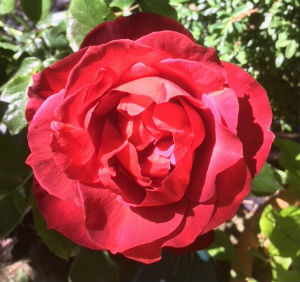 It’s believed that Queen Elizabeth the 1st adopted the rose as her emblem, to align herself with Mary Queen of Heaven and Earth and so accentuate her own virginal and Queenly state (however contested that might be now). A clever trick for a woman to play in a world where women had little power and her throne could so easily have been taken from her. She made herself the English Rose, symbol of beauty and purity. My soul soothed and lifted, I walked around the Church to see a wonderful Elder (Sambucus nigra) in full flower in the hedge. Its creamy white blooms are so heady in scent that it can be overwhelming to stand under a fully laden branch. The lacy parasols give food and shelter to many. The bees had already gone to their honey scented rest but many little creatures were still foraging amongst them and no doubt some would sleep under its floral quilt. Elder is one of the few plants that most people still know by sight, perhaps because it is still used to make cordials and jams it stays in our psyche as useful and necessary. In times past country people called this ‘Medicine Chest’, before modern day healthcare people looked after themselves as best they could with what they had to hand. 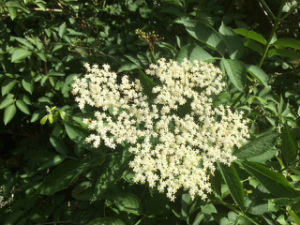 In many European cultures including our own this small tree was called Elder mother. Used for anything from headaches and bruises to the soothing of a small child's anxieties one can see why. Her lustrous berries are full of vitamin C, boosting flagging immune systems and fighting viruses such as the common cold, they are made into cordials and wines. The plant is mildly poisonous so care should always be taken in its preparation. Amongst the folklore that surrounds this plant is the belief that its wood made the cross that Christ was crucified on and that it was in an elder that Judas Iscariot hung himself. The mushroom that grows on dead Elder is called unsurprisingly Judas’ ear fungus. 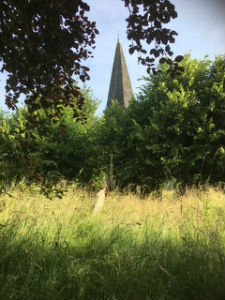 Leaving the Elder I made my way into the back of the graveyard and was transported to a wild meadow full of magnificent tall grasses, some as tall as me, waving their fanned seed heads, stems brushing against each other in a gentle cascade of soothing sound. Walking through the grass, a flutter of butterflies rose up from their hiding places; I counted twenty together in just one small area. They danced together and then settled again. 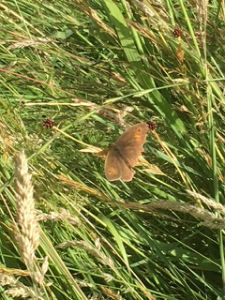 As my shadow fell across them wings closed shyly in case I was a predator, so it was with some difficulty that I managed to take this picture of a Meadow Brown (Maniola jurtina). You can see that this one may have suffered for its lack of shyness as it has a bird peck out of its lower wing. These delightful little creatures lay their eggs on the grass, the caterpillars feeding on the leafy blades. I had crouched low to take the photograph and while there noticed a high pitched buzzing, thinking that a teenage bee had stayed out late I searched to find the source of the sound. It wasn’t a bee at all but a very fast moving bee fly. These very cute and quite amazing little insects are mimics. They have evolved to look and sound very similar to bees, furry bodies and fast moving wings affording them some protection from predators. This particular bee fly seemed to be having a good look at me and came in several times very close to my face. Its movements were quick and involved long periods of hovering followed by speedy movement to another spot, somewhat reminiscent of a tiny drone. It has a very interesting if somewhat macabre life cycle; it bombs the nesting burrows of solitary bees and beetles with its eggs, the newly hatched larvae are parasitic, you can imagine the rest. As Tennyson wrote ‘ Nature, red in tooth and claw’. 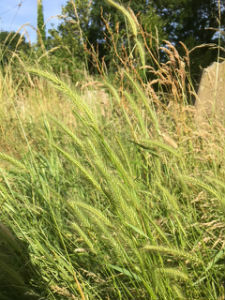 Amongst the many grasses I found Hordeum secalinum. This handsome and tactile plant is Barley’s wild ancestor. It’s one of many ‘old’ meadow grasses in the yard that show this is an ancient and special place, as if we needed reminding. As I left the meadow I noticed that the lime trees were about to flower and I will be back soon to hear the bees drunken revelry amongst the linden blossom. In the meantime I suggest that you take time for a healing walk at Woodchurch, smell the roses, watch the butterflies and cherish the things of God. Please don’t take chances with your health, any references made in my articles to medicinal, health or wild food value of plants are made as a point of interest, not as medical or health advice. Always seek the advice of a Doctor if you are unwell or wish to use alternative remedies and thereafter of a qualified herbalist if you wish to use plants or flowers. If you wish to forage for wild plants it's best to seek the advice and training of a wild forager and there are many suitable teachers that can be found via the internet. Nature demands respect.